Today is the last day to take advantage of the free bracelet promo from Pandora in the US and Canada. I have to admit I’ve had way too much fun during this sale! I indulged quite a bit, but since it’s the best promotion of the year and it won’t be back for another 6 months, I found a way to justify it ;). I pre-ordered at my store, however I couldn’t help myself and went back a few more times to get some additional things. I ended up focusing on pink with my purchases, which was a bit of a surprise to me since pink isn’t my favorite color. Imagine the look on my sales associate’s face when I told her I didn’t even like pink that much, lol! It is the color of the season and I managed to complete my pink bracelet with the purchase of the pink polka dot Murano and the car charm. I love how it turned out! I will post a video soon for it ;). The fairy tale themed and the animal charms were also high on my wish list. So adorable! I also couldn’t resist completing my new spring ring collection as well with the My Princess ring. It’s tapered in the back and complements the other rings in the new collection so well. I love all the bling with these rings and they look great stacked together, although perhaps not all three at once. My finger is not long enough for that to look good so I’ll just switch them around. I also picked up a couple other rings that I’ve been eyeing for a while. Rings are another dangerous addiction for me and being able to create different stacks with Pandora is a definite bonus. I already got mine, but I do love the frog charm I think it’s the prince charming. All the other charms im waiting for are the summer ones. Is it stupid to wait? Or should I might as well go ahead and try getting another free bracelet? Wish I could get the leather one for free, any thoughts? This is my first triple leather and I’m not sure if I got the right size. At the store, the small was tight, but now the medium is hanging a bit…will have to see if it gets worse. 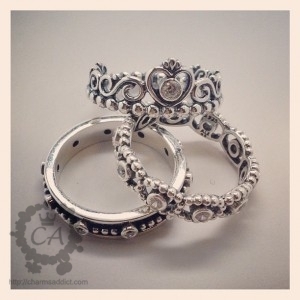 I love the Pandora rings, especially the stackable ones. Which rings do you have your eye on? Hi Orialis, sorry for the late reply, my Sunday got away from me! What did you end up doing? I always love this promo and can’t resist taking advantage of the great deal. Some stores will do substitutions for you. Just getting the frog prince would almost put you over the required spend. I did not go back to get another free bracelet 🙁 But someone mentioned that there is a promo coming up in July to get the free leather bracelet. I have finally filled my first bracelet, im just waiting for the summer collection, I am in love with the new muranos! Yes, there’s a leather promo in July, you can find all the current promotions under Lists in the main menu. I can’t wait for the summer collection! i finished a cherry blossom/ fairytale themed bracelet! yay! it was disastrous to my bank account but oh well as you’ve said, it only happens twice a year. Besides, you’ll be buying ths charms eventually so why not get something free out of it! Lol justifications, justifications! I cant wait to see your finished bracelet! Woohoo, good job Leah! I’d love to see a picture of your finished bracelet (you can post to the FB wall). I used the same justifications myself and they seemed to work quite well for my piece of mind ;). I shouldn’t have bought anything but I need a new bracelet so I figured now was as good a time as any! I bought the fairytale castle, the songbird and the double decker bus which I absolutely love and has been sold out for 4 months. They just got some in the day before the sale. My mom and I went together and she (who is now working on a 4th bracelet) bought the cherry blossom murano bead and two cherry blossom clips. That’s so wonderful you can share your addiction with your mom :D. Great picks, I love the new castle, it’s so amazingly detailed! Thank you! I’ve got such wonderful family and friends to help in my Pandora obsession for my birthday. I received the pave black heart, cherry blossom murano charm, frog Prince, Scottie dog, my friend swapped and got me my first oxidized bracelet during the Promo. I also received the two tone football helmet, the retired Pisces charm, pink zig-zag murano charm, two tone Pandora ‘s box, red poppy charm, shimmering blossom charm, pink pave lights charm. YES! I do love love love pink, HaHa! I pre-ordered the scottie, song bird, Easter bunny, scissors, cherry blossom murano and pink polka dot murano. Then I had to head back for a couple more things… hehe. Yea I rearranged a couple of bracelets, with the oxidized bracelet I’m going to start something new. I like to collect charms that I’m drawn to. There have been a few charms I kinda like but not love and they would look good as a starter theme. But I wasn’t drawn to the charm in that special way! I have one finished bracelet with all retired Pandora charms on it and have started awhile back on my second retired themed bracelet, over half way finished. I’m going to try and hold off awhile buying anything, at least till the bangle comes out!! So excited for that! That’s great! If you ever want to share your bracelets, I’d love to see them (post to the FB page) :). It’s so hard to be good, especially when that bangle is suppose to drop any day now! :O Thanks, Ashley, it’s hard to decide there’s so many to choose from. Can’t wait for the bangle promo in September. Me too! Although, I probably won’t be able to wait until September to get the bangle. I’ll probably get one when they come out soon ;). My husband indulged me with green for St Patrick’s Day and lots of fairy tale and pink, my favorite color, for my Easter basket. I can’t wait because I gave up Pandora for Lent! While today was the last day for most companies, locations that are closed on Sundays have the option to continue tomorrow. So there is still another day to go! Didn’t get the bracelet I wanted because my store doesn’t do upgrades to the clip station bracelets ;(. But excited for the September promotion ! Patricia, all Pandora retailers were prohibited from upgrading to anything other than the two-tone snap or all 14k gold snap bracelet. We are also prohibited by Pandora from allowing “downgrades” to less expensive bracelets. It’s an issue that comes up frequently, believe me! That is too bad :(. September promo will be even better! There are 2 stores within my home, both 30 minutes apart. Unfortunately none allowed to double purchase or exchange to leather, so I took your advice and hit both stores. Store #1/ purchased for my sister who will be celebrating her 25th Wedding Anniversary the Love Bouquet, the Mr. & Mrs. and the Wedding cake with the free oxidized bracelet. Store #2/ purchased the G/S Key to my heart, the Love You cube and 2 Heart Beats spacers for my own Pandora. I chose the free bracelet in silver since I have the oxidized one already. Hope to start a Garden Party theme on this one with my Tea for Two set and flowery beads. OI also want to start a red collection with Red Muranos and Red enameled beads when I get the red leather. Husband said he will get the Mother’s Day promo in April as I will be away when it starts. I’m leaving him a list of all the ones I want! Wow, that’s fantastic! I’d love to see pictures of your bracelets on the Facebook page. What do you have planned for your garden party theme and tea for two bracelets? It’s so fun to hear bracelet ideas! Lots of fun shopping during this promo! Was lucky to be allowed an upgrade. Will try to wait for the next 2 free bracelet promos for my next shopping spree. Leann, are there any ring promos (as there were last year) coming up? I love the free bracelet event too ;). Unfortunately, no ring promos this year :(. That’s why I indulged and got a couple with this bracelet GWP. Just out of curiosity, what upgrade did your store allow you to get? If we want an upgrade, we pay for the difference in price, right? Ex: upgrade to the silver with gold clasp? Hi Cats! I was able to upgrade to the multi strand one station clasp, paying the difference of course. I upgraded to the gold clasp…no problem! Leann: I have the same issue with my black triple. The small was too tight and the medium just hangs. I couldn’t stomach wearing it, so I’m hoping the store will let me exchange it for something else. I got a triple leather and it was tight at the store but now it’s hanging a bit, so I may go back and get the smaller size. I think it loosens as it wears and probably stretches out a bit. I have the same issue with my triple! I’m hoping to exchange it tomorrow! I’ve had better luck making a triple out of a double and a single! Hello, I would love if you updated the list with all pandora promo items, if possible. It is still the best list I found online, even if missing the last ones, so congratulations. I’ll add it to my to-do list :). Speaking of the Frog Prince I noticed Sunday that it had a $75.00 price tag on it and in the book and online it says $95.00…..wonder who made the mistake? Nice! You got the frog prince at your retailer for $75? It is $95 RRP. Thanks for posting about the promotion, I was going to get the 2 tone seashell and palm&coconut during my trip but after seeing your post I waited and got them with the free bracelet. Now all I need to do is decide what theme it will be and watch that I don’t get to carried away with the bracelet creator. So happy to help! Those will be perfect with the summer collection ;). Yup, not many sizes but I got one that was the right one. 🙂 It’s so pretty I’ll have to get the matching charm too ;). I used the promotion to make my first Pandora purchase. I wasn’t actually quite ready to do that but couldn’t pass up the deal. I chose the silver bracelet with the crazy clips and blue ribbon charm. I am now debating whether to wait for the September special to buy more charms or whether to plan on getting one in June. I originally thought the first charm I would purchase would be the camera since I drive my children crazy with pictures, but I opted for the blue ribbon because it has special meaning, and a blue cord of faith started me on this quest for a pretty and meaningful bracelet. That’s fantastic! Glad you took advantage of the promo, it’s such a good deal :). 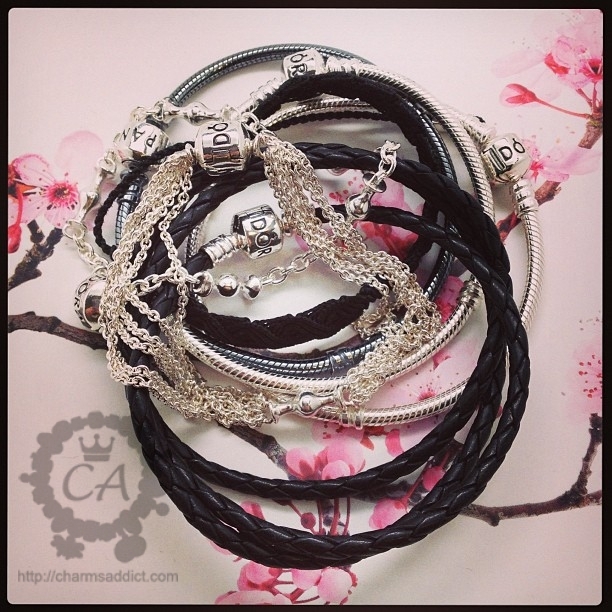 The next good promo is in July so if you can wait until then, you can get a free leather bracelet. 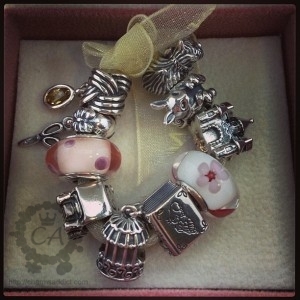 Have a question or comment for Charms Addict? Drop us a line! Like what you see? Enter your email to receive updates about new posts or weekly summaries in your inbox.